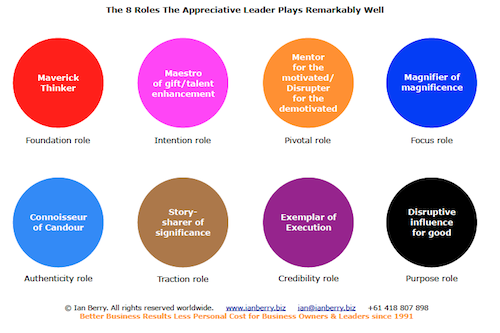 Next Monday morning I'm recommencing my Monday Morning Momentum videos with the first in a series about the 8 roles appreciative leaders play remarkably well. I'll be producing a video twice a month May through August and also providing a handbook that will be updated with each video. 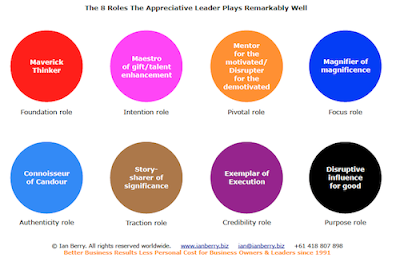 For a limited number of people at both Southern and Northern hemisphere times on 8 Monday mornings May through August I'm conducting a one-time-only online master-mind group about living the 8 roles in your own best way. I'll also be providing 8 1:1 mentoring sessions for each participant. Find out all about this and take up the super early-bird offer by securing your Southern hemisphere place here, and Northern here. Super early bird offer expires at 5 pm AEST tomorrow May 3rd.